Swap-bot is a service and a community. Swap-bot facilitates group snail mail and internet swaps. It removes the hassle of collecting swap participants and assigning swap partners. Swap-bot is also a community where swappers can connect, share, and have fun. Swap-bot was originally created to be a tool used by blog owners to facilitate mail swaps with their readers. The site has grown from a simple utility to a meeting place where at any given time there are over 500 public swaps being hosted. Swap-bot is completely free for our users. 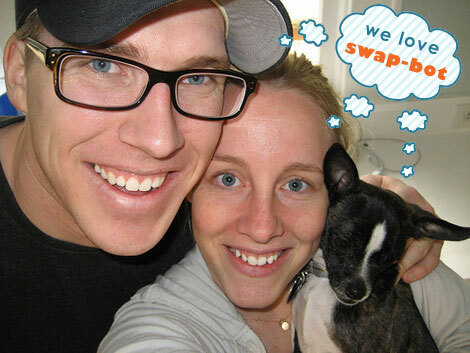 Swap-bot was created in the summer of 2005 by Rachel and Travis Johnson, a designer and computer programmer. Crusher the puppy is the site's mascot. Anyone over the age of 18 with a valid email address and mailing address is welcome to participate on Swap-bot.com. Swap-bot is committed to a policy of nondiscrimination and we encourage all of our coordinators to adopt a similar policy when regulating their swaps. Swap-bot does not encourage or support indecent or offensive content. However, we also do not censor any of the material posted by our users on this site except in extreme cases of fraud or danger. Each Swap-bot user is responsible for their behavior and their relationships with other members while using Swap-bot.com. Following are a few DOs and DON'Ts to keep in mind while using Swap-bot. Do respect and be courteous to your peers and Swap-bot Admins. Do carefully select your username; it cannot be changed later. Do keep in mind that all different types of people are members of Swap-bot. Do take your swaps seriously and follow all guidelines given by the swap coordinators. Do provide a correct and legitimate mailing address. You can't receive swap packages if you don't give your partners a real address. Do visit the Swap-bot blog to learn more about Swap-bot news, site updates, and fun crafting and swapping content. Do understand that different people have different points of view. Do remember that behind every Swap-bot username is a real person with feelings. Do fill out your profile as completely as possible. A detailed profile is helpful to your partners. Do keep in mind that the forums are a permanent and public record directly tied to your Swap-bot account. Do use the rating system honestly, consistently and in a timely manner. Do take the rating system seriously; it directly affects a member's reputation as a swapper. Do read the Forum Rules & Info page before posting comments in the forums. Do check out this forum thread for tips on how to have a positive swapping experience. Do remember to include your name, Swap-bot username, and email in your swap packages. Don't create multiple Swap-bot accounts. Swap-bot only allows one account per individual. Don't be rude, incite flame wars or be disrespectful of Swap-bot or other Swap-bot members. Don't publish the contact information of other members in an online public area. Don't use your swap partners’ contact information to send unsolicited emails, advertisements, spam, junk mail, or chain letters. Don't harass, threaten, insult or otherwise flame other members on the forums. Don't sign up for too many swaps. Keep in mind how much time you have available to devote to swaps. Don't leave unfair, revengeful, or dishonest ratings. Don't put "email me", or an equivalent, in place of your address on your account. This behavior indicates that you are trying to get around our one account per individual rule and it may lead to your account being suspended. Thanks for visiting Swap-bot. Have lots of fun!